With the arrival of her nineteenth birthday, Princess Kelsea Raleigh Glynn is ascending to her rightful place as the new Queen of the Tearling. Surrounded by enemies, including an evil sorceress possessed of dark magic, the young ruler stands little chance of success. But Kelsea possesses fearsome weapons of her own, including the Tear sapphire, a jewel of immense power and magic. As an epic war draws near, Kelsea’s quest to save her kingdom and meet her destiny begins – a wondrous journey of self-discovery and a trial by fire that will make her a legend . . . if she can survive. Let me just start off by saying…the blurbs on the covers, usually I don’t agree with them. This time I do. 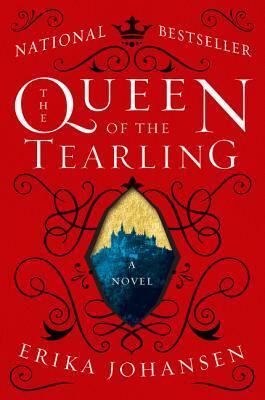 The Queen of the Tearling was everything I had imagined. And then more. We start off with Kelsea a 19 year old girl, who on her birthday has to go with some guards to become queen. After living her whole life in one cottage, never allowed to venture out of the boundaries surrounding it for fear that someone will kill her. She travels with these men, most of whom had been part of her mothers guard years ago and none of them are willing to tell her anything about her mother because they have sworn a vow that still holds even if she is dead. There is just so much that happens within the first 200 pages it would take me all night to tell you guys about it. So I highly, HIGHLY, suggest to read this book. It’s only 434 pages, and well worth it. Honestly I don’t remember the last time I was so pleased with how a book was, and yes, there were some things I still need to know. But there are two more books. And I plan on starting the second one tomorrow. So is Adaline. I love her, and the fact that she is a seer. The fact the book isn’t set in 1st person and jumps between characters sometimes. Seeing things and knowing what’s going on with the Red Queen is very interesting. While I have read books, like The Maze Runner, in 2 weeks, this book took me less then a week. So that should also inform you of how good it is. I really wish that we had learned more about Kelsea’s mother and who her father was, but I guess there are 2 more books. More information on the Red Queen, and the Sapphires and why she wants the Sapphires and why the Sapphires are reacting to Kelsea the way they do. Basically I just need more information about everything and that’s the only con. This entry was posted in Book, Book Tag and tagged book, book review, book reviewer, books, erika johansen, kingdom, qott, queen, queen of the tearling, review, reviewer, sacrifice, sapphire, sapphires, tearling, the queen of the tearling, tqott. Bookmark the permalink.